One of the best parts about taking a beach vacation is getting to bring a piece of that trip home with you in the form of a shell. 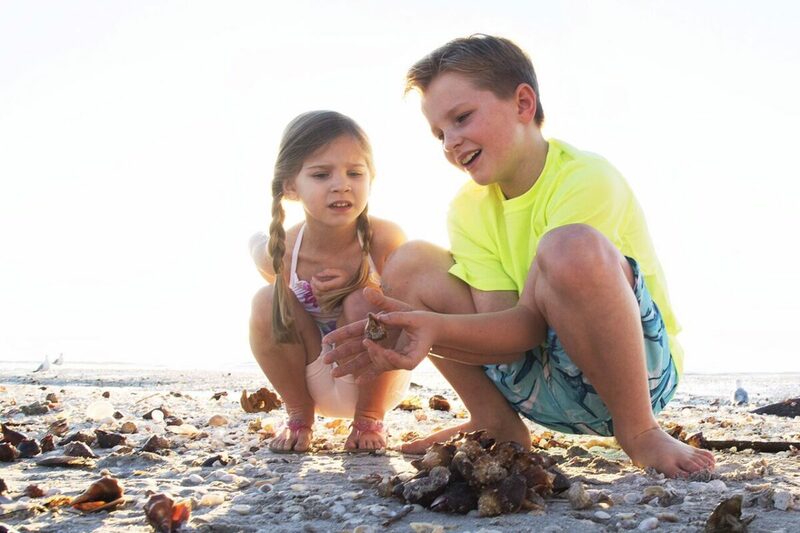 It is no secret, Sanibel Island is one of the best places in the world to go shelling and even us locals haven’t gotten tired of it! In honor of this year’s National Seashell Day, we’ve compiled a list of some of our favorite finds. Keep in mind, if you find a shell that is still living, please place it back in the water and let it be. From Bay to Calico to Rough, there are lots of scallops to be found on our shores. As you can see, they come in a wide variety of colors and sizes and several varieties are common finds. Keep your eyes peeled, though, for the elusive Lion’s Paw. Like the Junonia, it typically lives further out from shore but can sometimes be found following a good storm. The Horse Conch is Florida’s State Shell and the largest shell you can find in the state. Keep an eye out for young Horse Conchs (bright orange) at the Gulf water’s edge or the adult shells (darker brown) during winter or just after a storm. This local shell is a very common find! It is also a very active specimen if you come across a live one. Keep an eye out for these during the winter or after a storm. Named for its resemblance to the holiday spice, the Nutmeg is a small but hardy shell, characterized by brown bands of varying shades. It is most often found during the winter months and typically intact due to its sturdy exterior. This easy find, especially in the winter or after a storm, takes its name from the brown vertical stripes on its exterior that resemble lightning. Fun Fact: Lightning Whelks almost always whirl to the left, while most similar shells whirl to the right. Tulips are part of the same family as Florida’s State Shell, the Horse Conch. They’re easiest to find in the winter months or after a storm and this shell gets its name from the thin, dark spiral lines that form bands around the exterior. This univalve (far right pictured) has a taste for sea urchins and sand dollars and spends its time on the sandy bottoms of shallow water. However, finding one can come down to luck! The Alphabet Cone (center pictured) is a great prize find for any shell collection! It gets its name from the brown/orange shapes that band the shell and resemble letters. You’ll most likely find this shell during the winter season or after a storm. Not only is this shell a rare find, there also isn’t much known about the species itself. Until now! The Bailey-Matthews Shell Museum has 3 live Junonias and is learning more about the species every day. For more information on these shells and many more that you can find on Sanibel Island, visit Bailey-Matthews National Shell Museum next time you’re here.